This month’s block colors are shades of blue again. I quilted the first section of this one. I’m using an overall bubble stencil but I can’t see it very well so I’m mostly wandering all over. I finished assembling the left panel. I finished the lower left section that I was working on last month and started a new rosette. I added the purple markings this month. Here is the beginnings of the new rosette. This is sort of where it is going to sit in relation to what I already had. Oh my gosh! I’m doing so good. I’m actually sewing on a regular basis. Mind you, I’m bouncing project to project so I’m in no danger of actually finishing anything but progress is being made on the major WIPs I wanted to work on. This month’s block color is navy blue. I worked really hard on this last month. I was so proud. Yeah. It is exactly the same as last month because I got distracted by other projects. I started the panel that makes up most of the left side of the quilt. I already have the three blocks that make up the center of the quilt made and quilted. The carousel horse in the picture on the pattern is blue with a white mane. I found a blue I liked for the body but plain white seemed a bit flat. I auditioned some very light blues but wasn’t sure. I decided to ask the husband. He panics when I ask quilt questions because he thinks there is supposed to be a right or wrong answer and not just an opinion. So I prefaced this with “I just need an opinion. There isn’t a wrong answer.” I showed him both mane options. He picked white because…. (wait for it)…. because a light blue mane isn’t realistic. A light blue mane isn’t realistic on a horse with a blue body. He had no problem with the blue body. I was wrong. There obviously was a wrong answer. I made the mane white but used a polka dot white on white so it wasn’t too flat. You build the horse from all the pieces on a nonstick sheet and then peel him off and put him on the background. The horse is considered part A in this block. There are still parts B through D to go before I can put this block together. This is my never-ending hand piecing project. (I get tendonitis if I hand sew too much so I limit myself to just a little bit a day and you know I don’t work on it every day.) I forget when I started this. I tend to work consistently on it for a while and then let it sit for a while. Lately I’ve been pretty consistent. It is from Willyne Hammerstein’s Millefiori Quilts book 3. The book doesn’t actually have much in the way of directions. There are some diagrams of how a few of the pieces go together and then a diagram of how everything fits together and then the five shapes you need to use and that’s it. Just make it from the pictures. I was at a complete loss of where to start with this. How do you even pick colors? I decided to use a stack of really obnoxious fat quarters I had as the color selection. I combined this with grey tone on tone fabrics and black/white fabrics in places where I wanted the eye to be able to rest. I made up a few basic rosettes to practice and then picked a few that worked together and started combining them like in the diagram. Occasionally it isn’t clear what piece is supposed to be used but I think I’m figuring it out. I was pretty proud to finally get a whole chunk of it together this month. It seems less scattered now and more like a thing that actually may be finishable. I’m making a file to show how much is together. Blue dots show the parts I’ve finished. See why I call it the never ending project? It worked! It worked! I sewed so I would have something to say here. True confession time. I didn’t finish the whole post last time before it autoposted in January. I meant to list all the WIPs (Works in Progress) that I want to work on this year and then show if there is any progress in each one. This is a new project. I figured I could handle one beginner block each month and actually end up with a quilt for someone. The second block was a simple one to be done in pink. The word fabric was left over from a baby quilt for a kid who is about 6 or 7 now. I found out recently that a few people I work with don’t like polka dots. They find them creepy. They are obviously wrong. I love polka dots. I have a lot of dot fabrics at home. This was 2017 (shut up) mystery quilt from Bonnie Hunter. I did really well making all my pieces on the weekly schedule. There are hundreds and hundreds of pieces. And then it sat. I had an unexpected day off work during the super cold spell so I decided to spend it sewing. I went downstairs meaning to work on something else but I saw this and decided to work on it instead. Typical behavior for me would then be to wander off never to work on this again for months. But that didn’t happen! I came back the next day and worked on it again. I ordered a backing for it even. Powder used to lay right by the sewing machine and I always told her that it was a miracle that she never got her tail sewn. She never really got close though. This was my first time sewing with the Lucy-kitten. She decided that she could catch the moving machine needle between her front paws. I screamed, “Noooooooooooooo!” at her so loud that she went off and pouted because I scared her. Better hurt feelings than sewn together paws. I’ve even kept going. I’ve decided to quilt this in a simple all over pattern. I’m going to quilt this in sections using a Quilt as You Go technique. I’ve ordered the stencil and received the backing fabric. Here is the first section put together. Look what that kitten did to my high class design wall! This is destined to hang above the daybed in my cat/music room/library. The whole room was painted to show it off. Now I just need to finish it. It is fusible applique and quilt-as-you go. This is what I meant to work on when I got restarted on On Ringo Lake. This is the third panel. This is fusible applique that is then sewed down/quilted in one step. I finished quilting the second swan so this panel is done. Now I need to start tracing panel four. I found this on New Year’s Day and made my block for January on the first. I was an overachiever this month. The fussy cut center didn’t really work but I don’t care. It got me sewing. About a month ago one of my coworkers asked me out of the blue if I had finished any quilts lately. I was offended. She knows better. She knows I only start quilts and then they live half-done forever in my basement. I was also a bit concerned because actually I was applying myself diligently to finishing a quilt for her for her rapidly upcoming wedding. Yes, I hope ya’ll are sitting down, I finished a quilt project! I’ve always wanted to do a pineapple quilt block quilt but that’s a lot of work. I had only seen them paper pieced. I found a handy dandy ruler that made it a whole lot easier to do. I made the whole thing mostly with scraps from my magical scrap bin. No matter how many times I dug in there I always found more jewel tones to work with, even if I was sure I had emptied it of useable stuff the time before. I only messed up once and used the same dark fabric in the same block. I also decided in midstream to make this quilt as you go. I sewed together each row of 4 blocks and then layered and quilted them. I used the fussiest way possible to join them together but you can’t tell I did anything unusual from the front. There is just a folded under edge of the backing where each row is joined together on the back. I added borders the same way. I had a different plan for the borders but hated it once I started piecing it. I got the husband’s opinion. He got all nervous and told me that supported me in everything I do. I told him that I was hating what I was doing so critique away. I might have created a monster. He had unsolicited opinions about binding colors and fabric selection after the one day when I asked for his thoughts. It is at its new home now. I finished with 2 days to spare. I didn’t know how to act with that much wiggle room. I am lucky enough to have a dedicated sewing room in my basement. When we moved in I wanted to get some storage built. The husband found someone to do it. The plan was brilliant if I do say so myself. I wanted two floor to ceiling cabinets with a huge ironing board overtop of stacks of drawers. The idea was to be able to lay out a whole quilt top and iron the longest seams. I got the two cabinets fairly quickly. Then, crickets. He never came back to do the drawers. Never. The husband would see him around and ask and it was clear that part two of the project was never going to happen. Fast forward to now. I was trying to figure out how to make it myself. I thought about getting dressers or stock cabinets or something. Then, we ended up breaking down Z’s room since she is not able to come back here anymore. She has a dresser. It was only 4 feet long so it didn’t fill the whole space but it was available and free. I cleared out the plastic tubs I was using to store my smaller pieces of fabric by color. The fabric lives in the dresser now. We put the dresser in that space on furniture sliders so I can move it around fairly easily. Ideally, I wanted it on wheels because the ironing surface needs to be a bit away from the wall so you can drop the already pressed area down behind the board. Since there will be a gap, I know I will drop other stuff. I wanted to be able to move it so stuff wouldn’t be lost forever. I went to Lowe’s and got a very sturdy piece of plywood. I had them cut it to 2 feet by 8 feet. I placed it on the dresser. I had some thick batting. I put one layer on the board and stapled it in place. I bought 3 yards of Kona Steel for the cover. I stapled that in place making sure to pull it tight. I moved the dresser back into place and centered the board on it. I had brackets to put on the side of the dresser to support the edges of the board but I forgot that the dresser had a fancy lip on it. The brackets won’t lay flat. The board I chose is very sturdy so for now I’m leaving it alone. If it starts to bow later I’ll find some way to fix it. I added a flat wall plug extension cord to the plug behind the dresser. I used a command hook to keep the cord in reach. My iron doesn’t have an off button. If it is plugged in, it is on. I keep the iron to the left because I am left handed. I still had the issue of the dresser not reaching all the way across the space. I wanted it to look more finished so I bought some tension rods and the cheapest curtains on Amazon to hide my scrap bin. The whole project cost under $100 (not counting the initial purchase price of the dresser) and took less than an hour to complete. I have one unintended consequence though. Now hanging out in the sewing room with Mommy is more comfortable. Soon after this picture he was sprawled out full length. He doesn’t understand why he can’t play with the iron though. I may need to find a way to wall mount the iron so this fool doesn’t burn himself. Look! I’m sewing. I mean, sure, I list quilting as one of my major hobbies but I hadn’t been doing much of it. Recently I started working on two projects out of the gazillion I have in pieces in my sewing room. I saw this pattern on Instagram when they were testing it. I had to have it even though it was completely impractical. It is a bed sized quilt when done, which I don’t need. I can make it a bit smaller by leaving off the outer borders. If I hang it, it would need to go horizontal and I don’t think I have a big enough spot. I still don’t care. I love it. This is the center block. You trace the pattern pieces onto paper backed fusible web. Then you cut out all the pieces and build it. This block sits above the carousel block. This is designed to be quilt as you go. That’s nice because you don’t need to maneuver a big quilt through the machine. After I made the block I spray basted it to batting. Then I free motion quilt around all the pieces. Once the whole thing is together and quilted you add the backing fabric and quilt around the blocks to hold it all together. This is the block below the carousel. I also started on a snail quilt that I’ve had the pattern for for a while. The husband, who thinks he’s funny said, “That sounds like a slow project.” It turns out to be pretty quick though. I made all the bodies in one sitting. Then I’ve been making a few shells at a time. The finished lap sized quilt has 60 snails. That’s 2 in less than 30 days. I know, I’m shocked too. Of course this one had a hard deadline or it wouldn’t have happened so fast. The pattern for the whales is Preppy the Whale from Oh Fransson. It is a hard pattern to design with if you don’t want to make a zillion whales because it is long and narrow. I added the black and white checked stripes because the top was too boring without something else. I used the last of my Tula Pink yardage for the back. I couldn’t pass up the thematic opportunity to put the octopi on the back of the whale quilt. I actually made some progress on my Raspberry Kiss blocks. Are you shocked? I know I am. I’m not one for follow-through in my quilting. I got a few hours of sewing in this week and now have this many blocks. These are the four center fabrics I’ve worked with so far. I’m liking the way it looks with the beige corners around the brighter centers. It feels very peaceful to me. I was a complete quilting slacker in 2015. Thank god for people having babies (words which have never before been uttered on this blog and will probably never be heard again) or I’d have never gotten anything made. This was a baby quilt for a coworker in the spring. Another one in the fall. I did finish up my Hedgehog wall hanging at the last possible minute to include it with winter decorations. Seeing the theme yet? They ended up being all Oh Fransson patterns. Other than that, I managed to finish up my Spaghetti Junction quilt and get it basted. So in the spirit of turning over a new leaf and all that, I started a new project – because I don’t already have a room full of abandoned projects – shut up! I did something revolutionary with this project though. Something scary. You know the fabric. You bought the bundle because you loved it and then you put it aside for something special and there it sits. You can’t quite bring yourself to cut into it because you are waiting for the perfect project. First up was this FQ bundle of Birds of a Feather. I bought it for a specific pattern. When it got here I realized that it wasn’t going to work at all for the pattern I had picked. Mind you, I don’t remember what that pattern was because I never got around to picking any other fabric and making it. This has been sitting on my shelf for a while. It is going to be the center crosses in these Raspberry Kisses blocks. I’m using scrap white on white for the rest of the center and then doing low volume on the corners. This one actually hurt. The fabric on the left I special ordered because I liked other fabric from that line. It was really hard to find. I haven’t used an inch of it. The next three are from a bundle I ordered because I loved the line. I have it in two colorways. Never been touched. I had to give myself a firm talking to in order to open up the package and pull those out. The one with the cameras came from another bundle that I have that wasn’t open. I’m even using thread that at first I thought, “I should keep this and maybe quilt with it.” Then I thought, nope. Use it up. They make more. I’m making two sizes of blocks – 8.5″ and 4.5″. I’m going to keep going until I either run out of cross fabric or it gets big enough. You are about to see something that you hardly ever see on this blog – a finished quilt. I’m so happy with this one. I liked it as I was making it but it looks amazing hanging up. It is right next to a brick fireplace so it really makes the red stand out against the green wall. The hedgehogs are a Oh Fransson design. I quilted free form triangles in the sashing and then filled in every other one. I consider that proof that I’ve been reading Free Motion Friday at Kathleen Quilts too much! She always fills in her shapes. Now it is time to get back to quilting my Spaghetti Junction quilt. I’ve actually done some sewing. I’ve made a few hedgehog faces for my Christmas quilt. My mother gave me a bunch of my grandmother’s fabric. I want to make a quilt for my mother with her mother’s fabric. The problem is that it is all horribly ugly and some kind of cotton blend that is really rough. I’m thinking that it make it work I need to cut it up into really small pieces. I’m playing around with some small 9 patches. These finish at 3 inches. I’m thinking of setting them with alternating white squares. I’m not sure if I like it enough it commit to it yet though. I just received a big box with a rainbow of solid fabrics. I never use solids because I think they are boring and flat but I have an idea for a quilt that would require them. That’s why I need to stock up. Now I just have to map out the quilt design. I’m hoping I have enough here to make two quilts – one for me and one to give away. This project is everything I don’t do. I’ve even sewn a little more on my hexy quilt. Hand sewing still really hurts my hand so I only let myself do a little a few times a week. Someone who lives in this house recently inquired about the likelihood of this quilt being done by the time we are 50. It might happen. That’s row 4 of 10 being attached. I finished a quilt! I’m a starter and not a finisher but this had a hard deadline so I was motivated to get it done. I gave it to a coworker during our little baby shower for her yesterday. Side note – I gave a baby quilt to another person who was there. He talked all about how useful it was and how the baby slept on it and all kinds of nice stuff. He said they got a few quilts so they could wash and rotate. It was very nice. Then he showed me a picture of her using my quilt. That was also nice but it wasn’t my quilt. I just giggled to myself and didn’t say anything. This is Preppy the Whale by Elizabeth Hartman. The theme was underwater so I made the whales. Then I added borders to get it up to 36″ square. I quilted waves in the blue and seaweed in the pink vertical borders. Preppy the Whale has found some friends and turned into this. I’ve order some light pink tone on tone to add another border and then will bind it in the blue. I’m running out of the blue or I’d just make the final border from that. I’m thinking of quilting some seaweed into it on the pink vertical border strips. Whatever I do I have to give this away next Thursday so I better get a move on. I managed to get a little bit of sewing done this week. 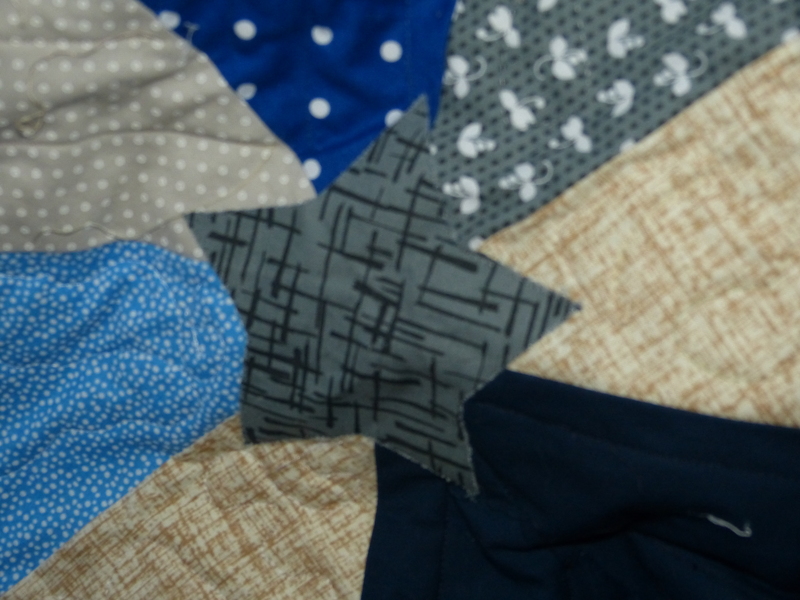 My hexie quilt is progressing slowly. Here’s one example of why this quilt is taking years. In the picture it looks like he is getting stabbed by the needle. He never did but he came close a few times as he flung himself upside down across the quilt repeatedly. I’m also starting a new baby quilt. It is supposed to have an underwater theme so I’m going with Preppy the Whale from Elizabeth Hartman. This is the first of four whales and then there will be a pieced border. It is no secret that I hate Disney stuff. Before 2008 I was mainly just not that interested but since then I’ve been dealing with an autistic child whose obsessions are always Disney and something else. The something else varies but Disney stays the same. That means at any given time she only has two topics of conversation and she talks nonstop. I want to scream, “Please, for the love of all that is holy, shut the $%# up about Disney! !” but that is considered rude. For the last year she has been obsessing about Disney cruises to the point that she knows the layout of all the ships and the number of bars. She gave me a whole monologue this weekend about how I have failed her father because I am holding him back from going on a Disney cruise. Explaining that her father thinks going on a Disney cruise would be a new level of hell that Dante hadn’t even imagined didn’t work. The child and her mother are going on a Disney cruise in June. This weekend when I went to pick up the child, the mother held out a bag and said, “We were wondering if you could make this up this weekend. I mean, if you can’t we can do it with Grandma.” Note the lack of a please, thank you, or question in there. The child explained that I needed to make something for them for their cruise. The level of stabby was high before this project even started. Apparently, on Disney cruises you need something called a fish extender. There is a fish decoration on the door and you hang pockets from it and people give you presents. They provided me with fleece and a nasty crunchy fabric with glitter that dulled my blade and needle. I decided to make it fancy and then threatened to sign it so they had to think of me every time they saw it. I cut two pieces of fleece 8″ x 24″. I layered them with batting in between. I sewed 1/4″ along the long sides to hold them together. I cut the pocket fabric 6″ x 11″. That was suggested on other sites I read in order to make pleated pockets. I folded over the top and bottom and topstitched the top so it wouldn’t fray. I didn’t stitch the bottom. I figured it will get sewn down when it gets sewn on the background. Of course I had to get fancy and fussy cut the Tinkerbells. Pin the sides, center the design, and then fold the pleats. I just eyeballed this. I did a double row of stitching across the bottom to reinforce that weight bearing seam and to make sure I caught the folded edge. I started with the first pocket at the bottom and then put two inches between the pockets. I bound the edges with the Tinkerbell fabric. I put a fleece hanging pocket on the back for a dowel rod. One finished fish extender (what a stupid name!). The husband has helpfully pointed out that there was no thank you forthcoming from either of them. I just love making projects for hateful people! 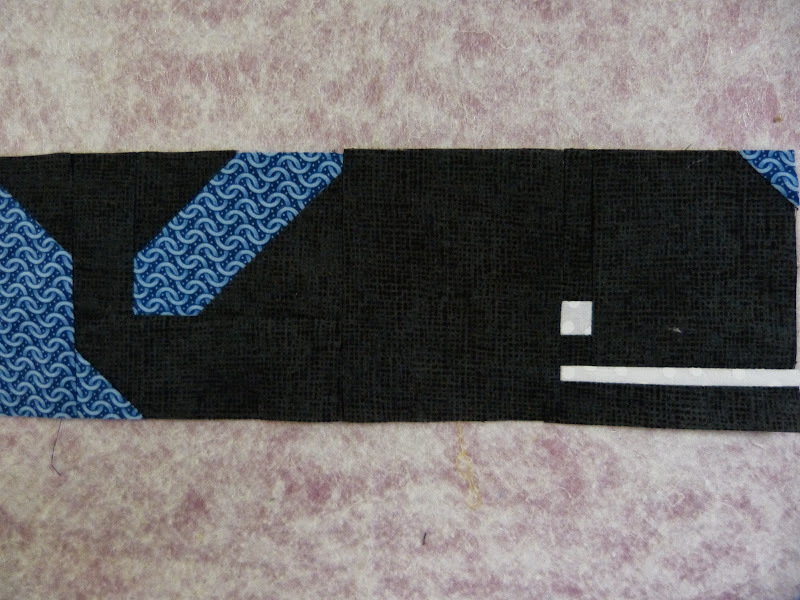 In happier sewing news, I started sewing the fourth row onto my hexie quilt. Last Saturday was Quilts of Valor’s National Sew Day. I sewed together this quilt that has been stuck on my design wall since last May. I got the first block done for my Christmas Hedgehog quilt. I have the fabric picked out for the other three too. They are all going to have the same face with different bodies and spines. All the fabrics have a little metallic thread in them. I also finished the quilting on this giant star quilt. It has a lot of stops and starts so I have lots of thread ends to get rid of. There is one small section in the center that needs removed and redone because the tension went wonky.